Students of the tarot will call this the reference book of the century! 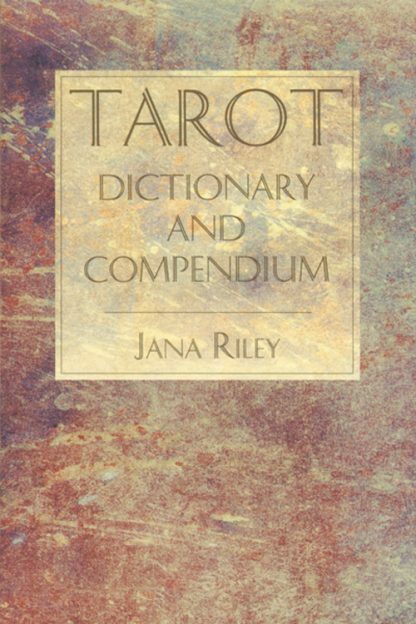 Includes basic definitions of the cards, correspondences (with esoterica, gemstones, runes, astrology, Huna, color, essences, mythology, and language), and a short section describing basic layouts. Jana Riley (a superlative researcher in the world of esoteric study) has quoted card definitions from major authors to provide succinct definitions of each card in the deck. Readers will gain new insights into card interpretation and how different teachers approach the tarot. Riley has collected material from major authors (both modern and traditional) in order to provide definitions of each card in the deck. Many of these authors also offer great number of decks, ranging from the wellknown Waite, Crowely Thoth, and Wirth decks, to the more modern, such as The William Blake Tarot of Creative Imagination, Tarot of the Spirit, Motherpeace Round Tarot, Shining Woman Tarot, The Mythic Tarot, The Merlin Tarot, The Dreampower Deck, The Barbara Walker Tarot, The Voyager Tarot. This the first time that students of tarot symbolism can combine card meanings from such an eclectic group of experts. This book is destined to become an invaluable resource for all interested in the tarot!